Spikey Massage Ball with Rainbow Rods inside provides both tactile and auditory sensory stimulation. 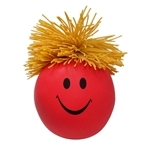 Kids will love squeezing and shaking them as well as using them for massage! 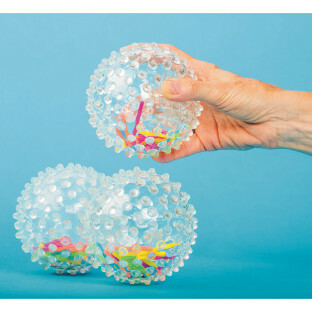 Good for both tactile and auditory sensory stimulation and fun to play with! 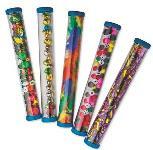 Watch and listen as colorful rainbow pellet rods inside the transparent vinyl balls create an audible sound that makes them great for tracking and grabbing attention! These massage balls also have a soft-spikey surface that’s great for gentle massage, tactile feel, and easier gripping. Soft and easy to grip. Inflated balls measure 4 1/2” diameter.